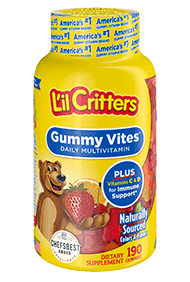 From the maker of L'il Critters, the #1 Kids Gummy Vitamin brand, comes a complete multivitamin in fun Super Mario™ Power Ups shapes. Great tasting, natural flavors: Berry, orange and lemon. ©2016 Nintendo. All Rights Reserved.